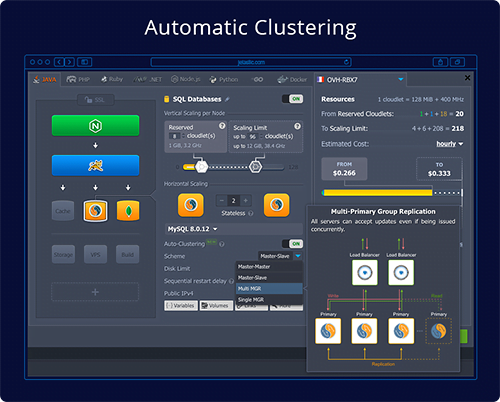 Auto-clustering now can be enabled right from the Jelastic topology wizard in one click. This functionality has been released starting from Jelastic 5.5.3 version for a set of databases and application servers. “Jelastic focus on developing and implementing auto-clustering is fully dictated by the rising demand from customers. We facilitate the process of reaching high availability and high performance for our users by transforming the complex task that requires too much expertise to a simple automated step,” says Ruslan Synytsky, Jelastic CEO and co-founder. It is a well-known fact that clusterization is already an obligatory requirement for production solutions to make applications and services highly available. However, the configuration of a reliable cluster is not a trivial task even for experienced developers and system administrators. So Jelastic introduced out-of-the-box clustering to ensure that applications are highly available by default. In addition, the Jelastic service providers and the owners of dedicated Jelastic PaaS installations can configure this functionality for any other templates by preparing the appropriate clusterization package with a help of Cloud Scripting technology. “The newly launched functionality lets us extend dogado product line with clustering-as-a-service that is highly demanded among the customers with large-scale projects. And the automation of the whole process eases the setup and management, so there is no need in extra support and maintenance efforts,” Andreas Richter, Product Manager at dogado. The auto-clustering feature can be enabled through the same-named switcher in the central part of the topology wizard. For databases, there is also available the choice of clusterization types (i.e. Master-Slave, Master-Master, Galera, Single MGR or Multi MGR). “We have growing businesses from India looking for the cluster setup of WordPress, Magento, MySQL, and this number is increasing. Jelastic has transformed this task of setting up a cluster just into a few clicks. As a result, greatly simplified deployment saves lots of time for our team as well, “ Chetan Mahale, Director at MilesWeb. “Jelastic private platform has become a key factor in our DevOps strategy while running environments for development, testing and even staging. The released auto-clustering feature provides us with a very comprehensive tool in order to deploy a reliable cluster in a trivially simple way. A strong capability with a lot of possibilities,” Jesús Mariano Pascual Díaz, Innovation Manager at GMV. This option is available starting from Jelastic 5.5.3 version and can be already used in production at one of the Jelastic service providers.